Red burgers go on sale in Japan on July 3. Last year Burger King Japan surprised its customers by introducing black burgers on its menu. Apparently its success with the limited time black specialty inspired the chain’s planners to come up with a new seasonal surprise this year, which is a completely red burger. 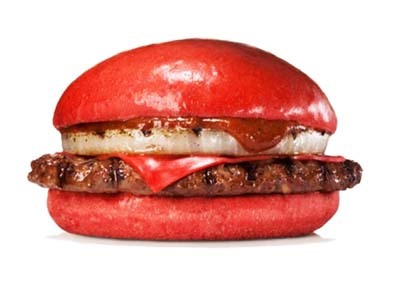 Named Aka (“Red”) Samurai burgers, the novelty goes on sale Jul. 3rd and will be easy to recognize for its red buns, red cheese and red hot sauce made from miso and hot peppers. They come in two varieties, one with fried chicken and the other with a beef patty. To give the burgers their bight red color, Burger King chefs added tomato powder to its buns and cheese. The red chicken burgers will cost ¥540. The Aka Samurai Beef burgers will be priced at ¥690. The chain has not forgotten its black burgers, either. It says that they have improved them and the new version will come with the same black buns, cheese and sauce plus a deep fried eggplant. This year’s Kuro (black) Shogun burgers will be available from Aug. 21 for ¥690. Both the red and black burgers will be available only at Burger King Japan outlets.